Preheat the oven to 200°C/fan 180°C/gas 6. Place the chicken in a large roasting tin, rub the oil all over it and sprinkle with a little sea salt and plenty of ground black pepper. Squeeze over the juice of two of the lemon wedges and roast for 1¼ hours. Add the bacon to the roasting tin and cook for a further 10 minutes until the bacon is crisp and the chicken is cooked and golden. Remove the chicken and bacon from the tin and set aside on a board. Add the bread to the roasting tin and toss well with the pan juices. Roast for 8-10 minutes until golden. Roughly chop the bacon, together with the chicken leg and thigh meat, into pieces (reserve the chicken breasts for the soup, overleaf). 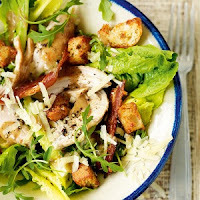 Place the cos lettuce and rocket in 4 serving bowls, then top with the chicken, bacon and croutons. Whizz the anchovies, garlic and Dijon in a small food processor until mixed. Pour in the extra-virgin olive oil and squeeze in the juice from the remaining lemon wedges. Toss the dressing through the salad and sprinkle with the grated Parmesan.